Arayo and I are surrounded by rowdy calls of "whoop, whooooop, whooooop". The sign in front of me reads "Please close the door. Northie has a drinking problem." We are not in a low-class bar but at the International Primate Protection League gibbon sanctuary in South Carolina. Northie, who likes drinking from the toilet, is a Newfoundland and the companion of the IPPL's founder and director, Shirley McGreal. 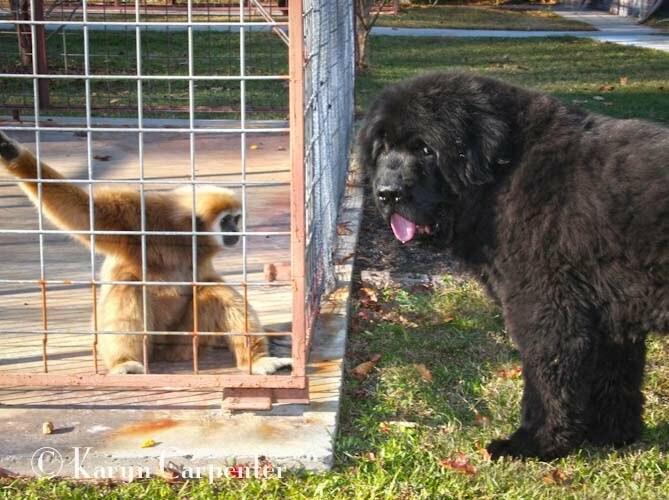 His unconventional family includes over 30 gibbons and a handful of otters who have found refuge here. Northie is lucky - he lives with one of those rare individuals who is not comfortable living in a world without doing her damnedest to make it a better place. In the early 70's Shirley saw the plight of primates that were being trafficked and decided to do all she could to stop it. That this calling has been dangerous and global in scope has not stopped her tireless work. Shirley's leap into saving the world's primates began in the early 70's while picking up freight at an airport in Thailand. She was stunned to see crates of animals awaiting shipment out of the country and felt they were begging her for help. She dove into research, and two years later she began the International Primate Protection League. Her investigations into illegal trafficking of primates have led her, at great risk, to go undercover into the compounds of animal smugglers. Her findings have exposed criminals, bringing them to justice and ultimately changing laws and banning the sales of endangered primates around the globe. She has grown her small organization to 15,000 worldwide members who help carry out investigations of trafficking and abuse worldwide. IPPL assists grassroots wildlife groups in their efforts to promote concern for primates, and supports rescue centers overseas, in addition to maintaining the gibbon rescue center in South Carolina. Recognized many times for her work, in 2008, Queen Elizabeth II bestowed upon Shirley the prestigious "Order of the British Empire", one of Britain's highest honors. Many primates owe their lives to Shirley McGreal, and, we humans owe her our gratitude for her courage, passion and work towards a just cause. If there were more people like her, the world would, indeed, be a much much better place to live. Arayo and I are honored to have spent time with her. PHOTOS - Northie lives with over 30 gibbons who have been rescued by his mom! 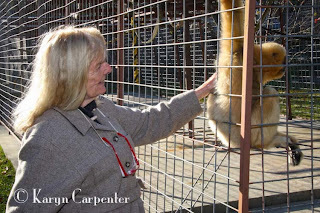 Shirely McGreal knows which of the gibbons need a good back rub. 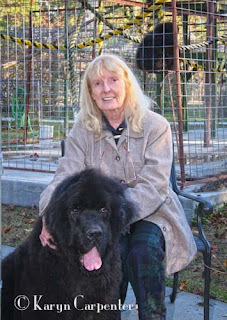 Shirley and Northie at home at the IPPL headquarters in South Carolina.